Home Race events Marathons How to spice up your fall marathon training? Preparing for one of the fall’s many marathons or half-marathons or even your first ultra? 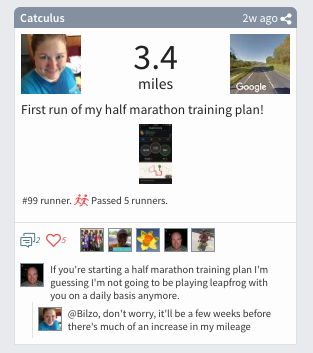 Racery’s virtual races are a powerful judgment-free way to keep you motivated and accountable! Virtual racer, Melissa Downs, training for the Baltimore Marathon. 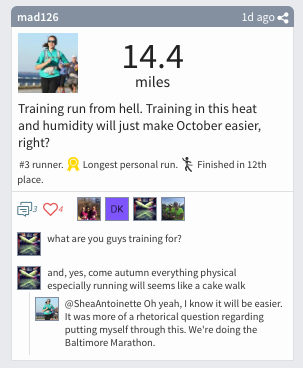 Like training in person with a running group or buddy, social media can often be a great source of inspiration and motivation. But in certain situations, like training for a marathon, social media can actually be counter-productive. When you have a less than ideal workout, your insecurities may mentally steer you to anticipate judgment by your peers. Even though you’ve had a solid and productive workout, you’re not celebrating hard work but worrying about being judged. In truth, what most people share in social media is 99% personal records and “best-of” moments. This sets a high bar. We are all human and have off days. It’s really hard to compete with the shiny ideals of social media, especially because the comparison is often subconscious. Faced with lots of curated and Photoshopped success, your social network can stop being a motivational tool and instead can become a lead weight pulling you backward. In a recent post in Women’s Running, Yu confessed that “social media killed her run” because at times she was too embarrassed to share some of her less impressive runs on her social feed. Catherine Cole, excited for her first Half-Marathon in November! That’s Racery’s philosophy too. We think about PRs in terms of accumulated distances and weekly or monthly accomplishments, not in terms of today’s miles per hour! In our virtual races, each athlete is on an equal playing field. It doesn’t matter if you can’t finish a 5K in under 40 minutes, as long as you do the miles. To keep you motivated and accountable along the way, we’ve also built out a toolbox of strategies to make your training miles more meaningful. Tool #1: Training is easier when you do it with others. Stay motivated by involving friends and family in a friendly challenge or by joining one of our free monthly community races! Tool #2: Avoid boredom with regular doses of adventure! You can add excitement to your training with our 360-degree street views, which are triggered each time you log miles! Use our virtual routes to tour exotic locations like Rio de Janeiro, Paris, or Tokyo, or scout your favorite coffee shop in New York City as you virtually run by it! Tool #3: Celebrate every run! Each time you log miles, your accomplishment is celebrated. We keep track of your position in the race, your top ten longest runs, plus a personalized streak record. You can double the fun if you’re in a team race, since you’ll also get updates on the team’s progress in absolute terms and versus other racers.